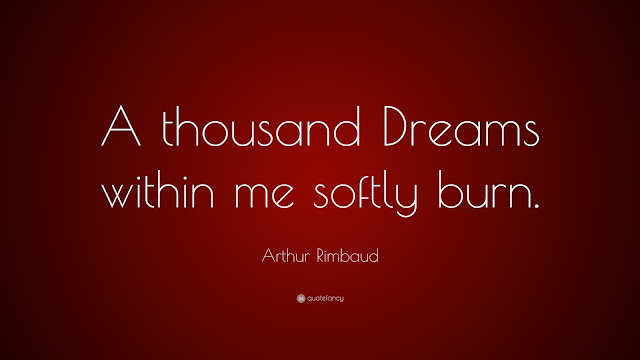 Arthur Rimbaud was born today, October 20, 1854. He was a young French poet who is known for his groundbreaking influence on modern literature and the arts, including many rock generation musicians, such as Bob Dylan, Jim Morrison, and Patti Smith. He is also known for his torrid love affair with poet Paul Verlaine. As a boy, Rimbaud was small and pale with light brown hair, and eyes that his lifelong best friend, Ernest Delahaye, described as "pale blue irradiated with dark blue—the loveliest eyes I've seen". At the Collège de Charleville he became a highly successful student; his schoolmasters remarked upon his ability to absorb great quantities of material. When 22-year-old teacher Georges Izambard started at the Collège de Charleville, he became Rimbaud's mentor. Soon a close friendship formed between teacher and student, with Rimbaud. At the age of 15, Rimbaud was showing maturity as a poet; the first poem he showed Izambard, "Ophélie", would later be included in anthologies, and is regarded as one of Rimbaud's three or four best poems. On July 19, 1870, the Franco-Prussian War broke out, between Napoleon III's Second French Empire and the Kingdom of Prussia. A week later, Izambard left Charleville for the summer to stay with his three aunts – the Misses Gindre – in Douai. In the meantime, preparations for war continued and the Collège de Charleville became a military hospital. By the end of August, with the countryside in turmoil, Rimbaud was bored and restless. In search of adventure he ran away by train to Paris without enough money to pay his fare. On arrival he was arrested and locked up in prison to await trial for fare evasion and vagrancy. On about September 6, Rimbaud wrote a desperate letter to Izambard, who arranged with the prison governor that Rimbaud be released into his care. As hostilities were continuing, he stayed with the Misses Gindre in Douai until he could be returned to Charleville. Izambard finally handed Rimbaud over to his mother on September 27, 1870, but he was at home for only 10 days before running away again. From late October 1870, Rimbaud's behaviour became openly provocative; he drank alcohol, spoke rudely, composed scatological poems, stole books from local shops, and abandoned his characteristically neat appearance by allowing his hair to grow long. 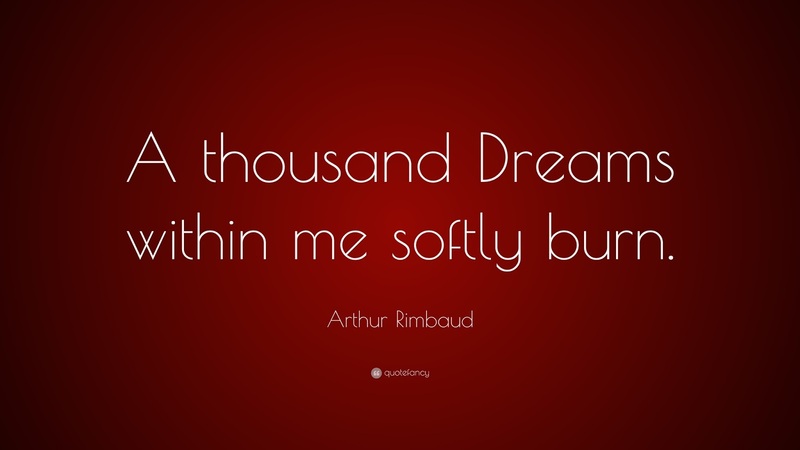 Rimbaud soon wrote to Paul Verlaine, an eminent Symbolist poet. Rimbaud sent Verlaine two letters with several of his poems, including the hypnotic, finally shocking "Le Dormeur du Val" (The Sleeper in the Valley), in which Nature is called upon to comfort an apparently sleeping soldier. Verlaine was intrigued by Rimbaud, and replied, "Come, dear great soul. We await you; we desire you," sending him a one-way ticket to Paris. Rimbaud arrived in Paris in late September 1871 and resided briefly in Verlaine's home. Verlaine's wife, Mathilde Mauté, was 17 years old and pregnant, and Verlaine had recently left his job and started drinking. In later published recollections of his first sight of Rimbaud at the age of 17, Verlaine described him as having "the real head of a child, chubby and fresh, on a big, bony, rather clumsy body of a still-growing adolescent," with a "very strong Ardennes accent that was almost a dialect." His voice had "highs and lows as if it were breaking." Rimbaud and Verlaine began a short and torrid affair. They led a wild, vagabond-like life spiced by absinthe and hashish. The Parisian literary coterie was scandalized by Rimbaud, whose behaviour was that of the archetypal enfant terrible, yet throughout this period he continued to write poems. Their stormy relationship eventually brought them to London in September 1872, a period over which Rimbaud would later express regret. During this time, Verlaine abandoned his wife and infant son (both of whom he had abused in his alcoholic rages). In England they lived in considerable poverty, scraping a living mostly from teaching, as well as an allowance from Verlaine's mother. Rimbaud spent his days in the Reading Room of the British Museum where "heating, lighting, pens and ink were free". The relationship between the two poets grew increasingly bitter. In late June 1873, Verlaine returned to Paris alone, but quickly began to mourn Rimbaud's absence. On July 8, he telegraphed Rimbaud, asking him to come to the Hotel Liège in Brussels. The reunion went badly, they argued continuously, and Verlaine took refuge in heavy drinking. On the morning of July 10, Verlaine bought a revolver and ammunition. "In a drunken rage," he fired two shots at Rimbaud, one of them wounding the 18-year-old in the left wrist. Rimbaud initially dismissed the wound as superficial but had it dressed at the hospital. He did not immediately file charges, but decided to leave Brussels. Verlaine and his mother accompanied Rimbaud to the railway station. On the way, by Rimbaud's account, Verlaine "behaved as if he were insane." Fearing that Verlaine "might give himself over to new excesses." Rimbaud "ran off" and "begged a policeman to arrest him." Verlaine was charged with attempted murder, then subjected to a humiliating medico-legal examination. He was also interrogated about his correspondence with Rimbaud and the nature of their relationship. The bullet was eventually removed on July 17, and Rimbaud withdrew his complaint. The charges were reduced to wounding with a firearm, and on August 8, 1873, Verlaine was sentenced to 2 years in prison. In 1874 he returned to London with the poet Germain Nouveau. They lived together for three months while he put together his groundbreaking Illuminations. Rimbaud and Verlaine met for the last time in March 1875, in Stuttgart, after Verlaine's release from prison and his conversion to Catholicism. By then Rimbaud had given up writing in favor of a steady, working life. Some speculate he was fed up with his former wild living, or that the recklessness itself had been the source of his creativity. 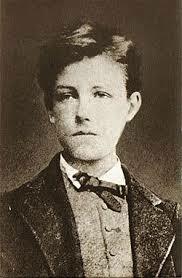 Rimbaud died on November 10, 1891, at the age of 37 from bone cancer. Rimbaud's poetry, as well as his life, influenced many 20th-century writers, musicians and artists, including André Breton, Dylan Thomas, Henri Cartier-Bresson, Jack Kerouac, Pier Paolo Pasolini, Neal Cassady, Vladimir Nabokov, Bob Dylan, Luis Alberto Spinetta, Patti Smith, Tom Verlaine, Léo Ferré, Henry Miller, Van Morrison, Penny Rimbaud, Jim Morrison, and Richey Edwards. Rimbaud's life has been portrayed in several films, including Italian filmmaker Nelo Risi's film Una stagione all'inferno ("A Season in Hell") starring Terence Stamp as Rimbaud and Jean-Claude Brialy as Paul Verlaine. In 1995, Polish filmmaker Agnieszka Holland directed Total Eclipse, which was based on a play by Christopher Hampton who also wrote the screenplay. The film starred Leonardo DiCaprio as Rimbaud and David Thewlis as Paul Verlaine. In a scene in the film, I'm Not There, a young Bob Dylan (played by Ben Whishaw) is portrayed identifying himself as Arthur Rimbaud by spelling Rimbaud's name and giving October 20 as his birthday. Thanks for this very comprehensive posting.